We met these homeowners at the Dayton Home and Garden Show. They knew it was time for some updates on the outside of their home in Dayton. The area they wanted to update was on the side of their house, between the garage and the side entrances to the house. Anyone who came to the house would enter through one of these doors and the area would be the first thing they saw when they pulled up. 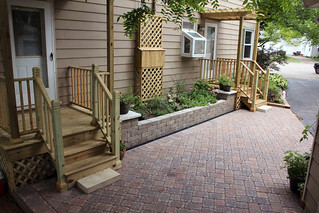 The existing area consisted of old cracked concrete with settling and cracked concrete steps, old aluminum awnings over the doorways, and a small planter bed with rotten railroad ties. There were also other issues with the area. Water would run off the driveway, accumulate along the steps and side of the house, and would just lay there. The utility boxes and meters were in plain sight on the side of the house and were an eye sore for the area. 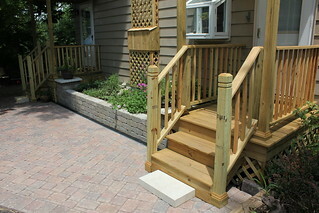 We first removed all of the old wood posts and banisters, as well as the aluminum awnings. 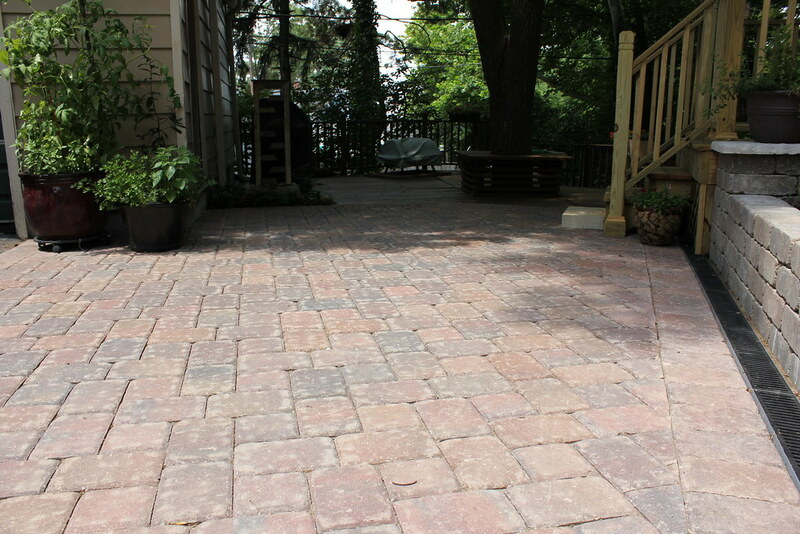 Next, we excavated all of the existing concrete patio and steps but left the concrete stoops. We also removed the existing planter bed. 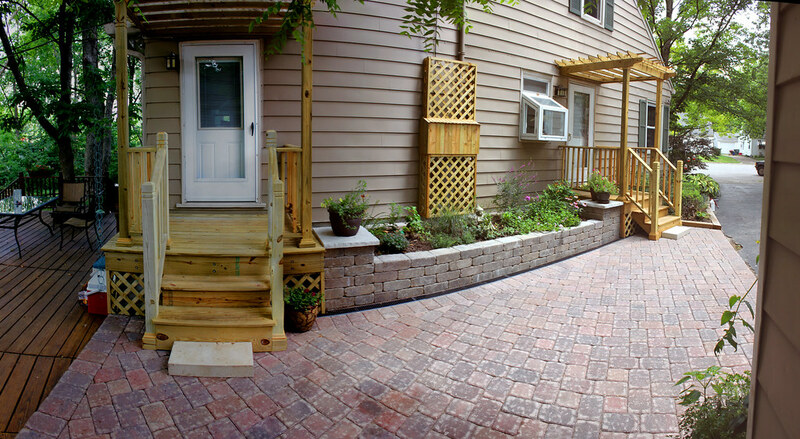 After building the area up with base material, we installed tumbled pavers throughout the area, a ridge drain across the back of the entire area, and a new and larger planter bed. 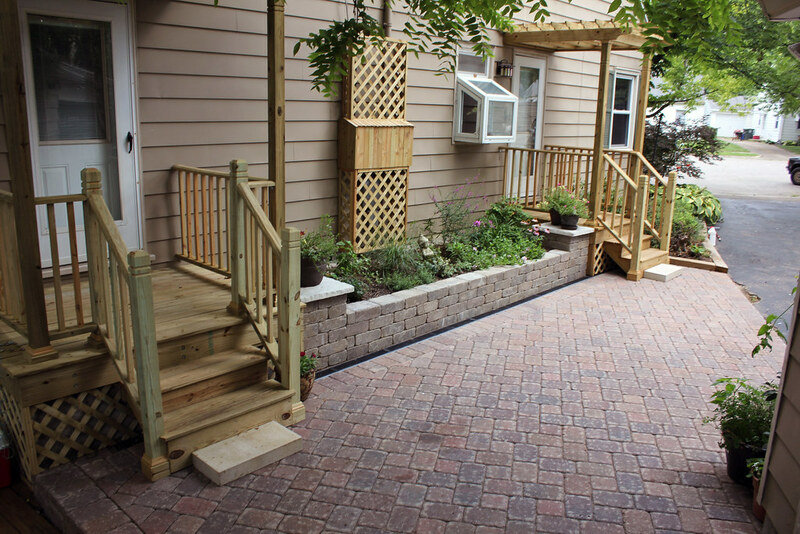 Our private carpenter installed all new decking, lattice, banisters, awnings over both of the doorways, and a utility hide. The tumbled pavers gave a very rustic appearance to the area and made it seem as though they had always been there. 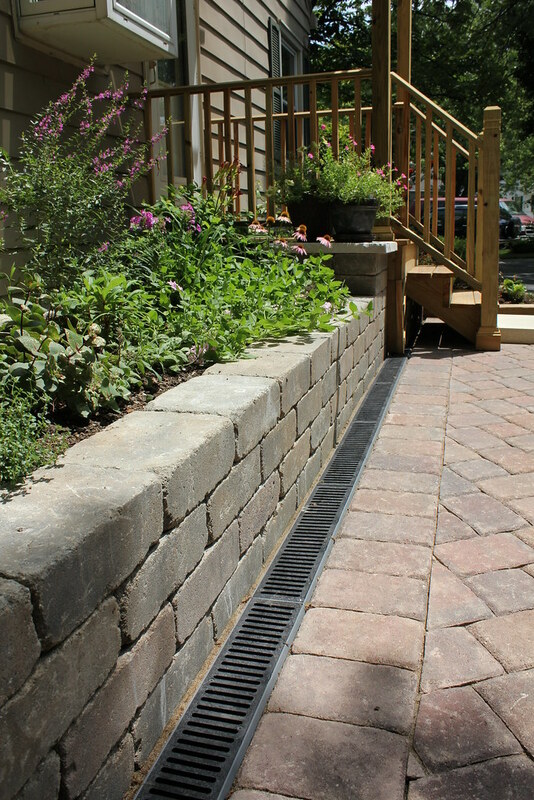 The ridge drain was run underneath the new wood steps and along the new block planter bed. We attached a drain tile to the end of the ridge drain. It collected all of the water that ran off the driveway and across the pavers and prevented the water from sitting on the area. The new planter bed was taller and longer, leaving plenty more room for more plants. The new decking covered the existing concrete stoops and the steps for both doorways were brought out directly forward of the doors. The new awnings had an incandescent plastic covering over the tops so they would let light into the doorways without letting water or debris from the roof fall onto the entryways. The utility hide was made to match the new banisters and decking and hide the utility boxes from sight. It was made to be easily removed if access to the utility meters was necessary. 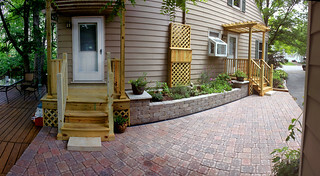 The homeowners were very pleased with the new area and couldn't wait to start entertaining their family and friends!